HashMap<K, V> is fast, versatile and ubiquitous data structure in every Java program. First some basics. As you probably know, it uses hashCode() and equals() method of keys to split values between buckets. The number of buckets (bins) should be slightly higher than the number of entries in a map, so that each bucket holds only few (preferably one) value. When looking up by key, we very quickly determine bucket (using hashCode() modulo number_of_buckets) and our item is available at constant time. 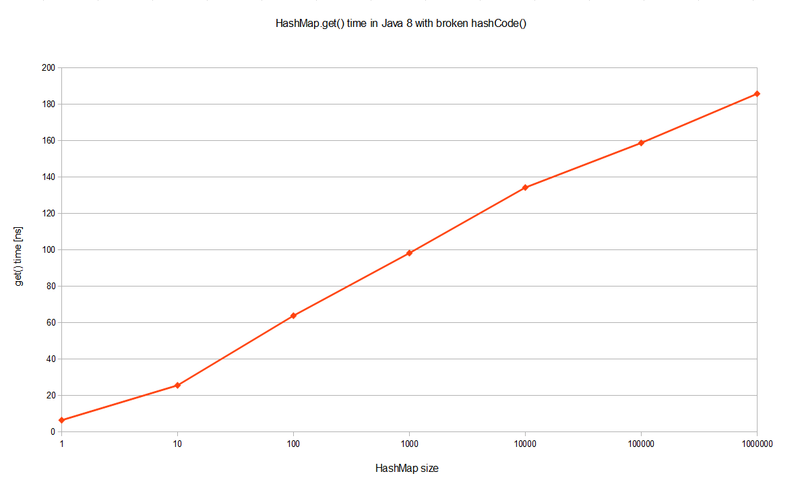 Interestingly Java 8 is on average 20% faster than Java 7 in simple HashMap.get(). The overall performance is equally interesting: even with one million entries in a HashMap a single lookup taken less than 10 nanoseconds, which means around 20 CPU cycles on my machine*. Pretty impressive! But that's not what we were about to benchmark. Results for Java 7 are to be expected. 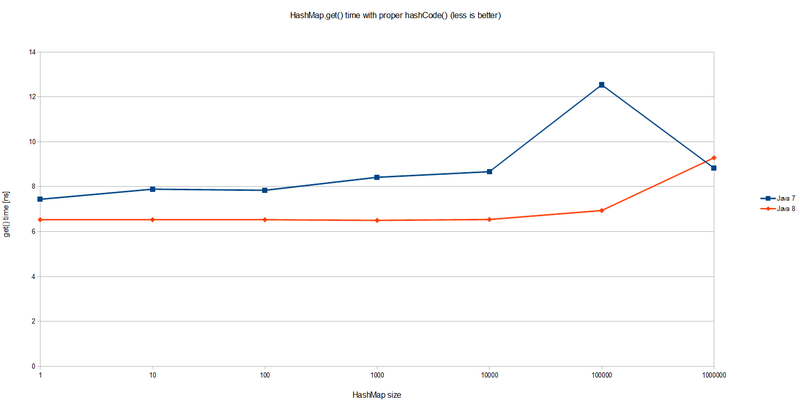 The cost of HashMap.get() grows proportionally to the size of the HashMap itself. Since all entries are in the same bucket in one huge linked list, looking up one requires traversing half of such list (of size n) on average. Thus O(n) complexity as visualized on the graph. What is the reason behind such a tremendous performance improvement, even in terms of big-O notation? Well, this optimization is described in JEP-180. Basically when a bucket becomes too big (currently: TREEIFY_THRESHOLD = 8), HashMap dynamically replaces it with an ad-hoc implementation of tree map. This way rather than having pessimistic O(n) we get much better O(logn). How does it work? Well, previously entries with conflicting keys were simply appended to linked list, which later had to be traversed. Now HashMap promotes list into binary tree, using hash code as a branching variable. If two hashes are different but ended up in the same bucket, one is considered bigger and goes to the right. If hashes are equal (as in our case), HashMap hopes that the keys are Comparable, so that it can establish some order. This is not a requirement of HashMap keys, but apparently a good practice. If keys are not comparable, don't expect any performance improvements in case of heavy hash collisions. Why is all of this so important? Malicious software, aware of hashing algorithm we use, might craft couple of thousand requests that will result in massive hash collisions. Repeatedly accessing such keys will significantly impact server performance, effectively resulting in denial-of-service attack. In JDK 8 an amazing jump from O(n) to O(logn) will prevent such attack vector, also making performance a little bit more predictive. I hope this will finally convince your boss to upgrade. *Benchmarks executed on Intel Core i7-3635QM @ 2.4 GHz, 8 GiB of RAM and SSD drive, running on 64-bit Windows 8.1 and default JVM settings. It is not clear from this article, for cases where hashcode is same and ends up in the same bucket, how is the performance is improved. "If hashes are equal (as in our case), HashMap hopes that the keys are Comparable, so that it can establish some order." Before Java8, HashMap used to maintain the same hashCode-valued-entries in an ad-hoc linked list, which would produce O(n) lookup time at worst case. Now, with Java8, HashMap maintains such hashCode-valued-entries inside a binary tree if the number of clashes exceeded 11, for which JDK 8 yields O(logn) worst case performance in case of catastrophic hash collisions. This is the improvement has been referred to here. Comparable, so that it can establish some order. How really hashmap handles entries in Tree, if hashes are equal. As Hashmap from Java 8 needs to be compatible with Java 7 and lower versions.